The Misadventures of Ka-Ron the Knight, written by Donald Allen Kirch, tells the tale of Ka-Ron- the bravest of all knights, a strong and charming man who has adoring women wherever he travels. He is famous, feared, handsome, heroic and destined for great things within his kingdom. However, a lustful night with a childhood friend changes his life when her mother seeks revenge and justice. Destined to live out his days now as a woman, Ka-Ron will now learn about life and love as a female. 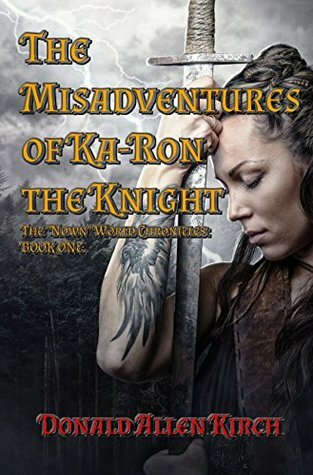 Prepare to be launched into a weird and wonderful world of knights, Wiccan power, passion and magic when you read the story of The Misadventures of Ka-Ron the Knight. The Misadventures of Ka-Ron the Knight has a taste of all genres, from fantasy to romance and action to comedy. The various themes keep the plot line exciting and enthralling, as you delve into a world of knights and magic. The book is easy to read but once you have concluded the book you realize the actual plot line was quite complex. As each character (who range from dwarfs to dragons, to elves and Xows, covens of vampires and more) enters the story, it adds a layer and element of truth and understanding to the complexity of the situation. I enjoyed the banter between Echoheart the horse and Ka-Ron, as they ventured together throughout the kingdom, but my favorite duo was Jatel and Ka-Ron as the explored their new found “friendship”. At times their story could be a little confronting, however, the desires and encounters the duo felt were also comedic at times. Their dysfunctional but co-operative relationship develops over the story, portraying the epitome of character progression. One line sums up the new experiences when Ka-Ron realizes that “On the battlefield of desire, women were the better warriors”. It explores some interesting ideas about gender roles and how each gender is seen in the eyes of others in society. At times you really felt for Ka-Ron as he became a puppet to witchcraft, overcome with desire and seduction- and this time as a woman. Donald Allen Kirch was able to weave the story together in a fun and engaging way. At no point was I bored with the story line, as there was always a lingering sense of adventure and excitement on every page. As a fair warning, there are sexual scenes throughout the novel which could sometimes be a little intense (graphical and sometimes non-consensual) and felt a little unnecessary at times. However, the story line moves forward from these scenes and instills a sense of adventure as they continue their quest. What I enjoyed most about The Misadventures of Ka-Ron is that the story was unpredictable- the characters made decisions you would least expect. With magic thrown into the mix, be prepared for a thickened plot line that is precarious, to say the least. I would would recommend this to anyone looking for an easy to read knights and magic style story with a dash of humor, romance and adventure.